Não tem como não vê-lo se estiver vivo; sua coloração é contrastante com o entorno e ele é grandalhão. Easy Kill. Encontrei-o no dia 24/05/16 perto da ponte de Etérnevoa. Morto hoje no Goldrinn às 08:30h (horário de Brasília), próximo ao Covil de Gruul. Matei ele hoje(08/06/2018) às 18:00h(horário de Brasília), próximo do Covil de Gruul(60 22). He hits hard but is slow and kite able. He summons little rock minions I believe 3 times total; if you fear them and keep kiting they will de-aggro. As a hunter, I kited him down from around the Skald location into Evergrove, put the pet on him long enough for him to use the Thunderclamp ability he has, this agro'd the guards to him.. The rest was cheese. Hit a 9k armor pet for almost 1k when he was full size, and under 200 by the end, much like the elite golems in hellfire. He also has warstomp to stun, and used that twice on my pet during the kite. This mob has a ton of hit points. He will spawn small shardlings, usually one at a time, about 2-3 times during the fight. As you lower his hp, he physically gets smaller and smaller. Found him outside Grull's Lair last night. Right before the entrance there's a spot to the right that's good to fight him and he'll pat to that spot for you. We four manned him (war, shammy, druid, hunter), but I'm guessing a group of three 68s could do it without to much fuss. Got this guy today with a 4-man team of Rogue, Druid, Shaman, Priest. The Shaman used his Earth Elemental to tank him half the fight which was kinda funny. Kind of a long fight, the rogue took out the adds when they spawned, the priest kept the Druid and the Elemental alive. He dropped mail blue shoulders of the Invoker. Frost mage kited while priest/rogue whacked on it. Dropped Leather shoulders of the Bandit. Easy to do 3 man. He will become smaller and smaller dealing less damage the more damage he gets. Soloed him right now, it was tough but fun, kited him on the road up to netherstorm, he died a few hundred yards from the bridge. Failed like three times, once because Maggoc came and once because other mobs came and dazed me, so watch out for those. I used felguard to intercept stun him when he got to close. 208 armor, +24 agility, +36 stamina, +48 attack power. Requires level 68.
two-manned him, fury warrior (dual wield) and a disc priest. took about 3 minutes. he crit for about 2700 when I was in zerk stance.. ended up staying in battle for most of the fight. dropped the mail shoulders "of nature protection" - 46 stam, 30 nr. Soloed this guy as a 67 affliction lock, dot kited him to evergrove and just kept running around it in circles, the guards helped kill. 2-manned, 67 shaman and 68 rogue. shaman just frost shock kite and rogue full nuke. Kited as lvl 69 Affliction Lock. Just kept casting curse of agony, corruption, and siphon life. I could life tap since he was so far away and not have to worry. Easy stuff for kiting classes. I kited him to Area 52 as a lvl 60 mage. The bruisers did not aggro :( I kited him around the town for several minutes with rank 1 fireblast, trying to think of something to do. Eventually he aggrod a guard somehow... maybe a random aoe as he was pathing. He pwned that guard. He then pwned another guard that was also attacking him. Together they got him down to maybe 85%. I kited him around some more, but eventually messed up and he killed me. I tried different things, Death By Peasant and a Thornling, in hopes that he would use his aoe on them and aggro a guard. But he didn't use his aoe on them. Do not expect the guards to kill him for you, unless you can find a better way to make them aggro. Kited him from Razaan's Landing to Area 52 as a level70 demo warlock, spent around 15minutes. Sac'd my voidwalker for Lifetap/HP regen & used Curse of Agony and reapply rank 1 Corruption every 4 sec. to have him leashed. He is slow so easily kitable. 3) you can run on the roads and therefore avoid other mobs, but opposing faction might be a troublemaker when kiting. 4) toke me about 10mins with avg fireblast dmg of 1.1-1.5k (made 3 managems and used them all when possible).. used trinkets, combustion and presence of mind every time they were up and at the begin i toke about 10k (~10%) hp from him with 2x Pyroblast and 1x Fireball. This mob is actually very soloable for people with less than 70 if you are caster and have big enough manapool/mana regen..
rogues and warriors... not so easy to solo... consider a group or someone who can kite it.. I'm a level 69 Shadow Priest. Kited him to Evergrove with rank 1 Shadow Word Pain spam with ease, NPCs killed him and I got the loot. Easy, easy fight for casters, just use a low ranking instant-cast so you don't run out of mana. If you see this mob DO NOT let him patrol to Vim'gol's Circle, He will bug out, and go through the ground. Very easy to kite as a warlock. I kited him to Area 52 from Blade's Edge. Curse of Doom, and life tap when needed. The guards will kill him, very easy rarespawn. Tried to kite him from around 69,67 to mok'nathal village as a lvl 70 warrior. couldn't do it because he was running faster than I did and he was immune to slowing effects also hit me for around 1k -1,5 k damage, got 7k armor with the gear I had on at the time. 70 Affliction lock, easily doable. Cleared a few mobs from where he was to the path leading to mok'nathal village, then went up to him, trinketed UA, Corruption, Amped CoD and sipon, along with my succubus out with soothing kiss for extra dps. Just kept up the dots, jump turn when nightfall proc'd, and kept spamming siphon so he wouldn't de aggro. Wound up killing him before I even got to the village to let the guards have a go at him. At level 70 nothing attacks you if you run him up and down the path he's nearest to. This was a bit difficult as a 66 mage, ended up ice lance kiting him to evergrove from about 61, 22 and had the gaurds kill him (stupid guy was immune to slows). Ran a bit low on mana because I was ice lancing a bit too much, but managed to get a tick of evocation while kiting, so it was all good. If I did this again I would definitely have a mana potion with me. tried to kite him as a 70 warlock and after a certain distance hed evade bug back to where he started, and after this had happened twice he despawned in front of me, im guessing this is blizzs attempt to keep kiters away? DO NOT KITE TO GYRO-PLANK BRIDGE TO A52! He bugged out for me and started evade bugging and just staying there, kite to Evergrove if anywhere! Just solo kited him on my level 69 warlock, Took him from down near that Orc village in blades edge, into Area 52. He didn't evade bug on any of those brides. So people who did must of just had bad luck. Just soloed him as 70lvl warlock. Nothing fancy, just kept freshing dots to prevent him from evading and took him around the Mok'Nathal Village. With Boar's Speed enchant on boots, he couldnt even catch up, which is silly. :) Oh and hes immune to Curse of Exhaustion. Easily done as 64 warlock and 68 rogue. Warlock kited him, Rogue took out his spawns. Warlock had about 6.55% hit (52 hit rating from gear + 1pt in Suppression). He was immune to both Fear and Curse of Exhaustion, but not Stun. Didn't matter though, with Minor Speed on my boots, I could outrun him even without cc. Amazingly he never lost aggro or evaded, just kept Agony, Siphon Life, Corruption, and Immolate on him the whole time, Life Tapping when SL filled up the health bar. Stupid Mok'Nathal Village npc's didn't help kill him though, so had to kite him around through the village a while. Huts on both ends of the village can be run around of, good way to get some distance on him if necessary. Soloed him as a protection spec pally. stun him to heal, bubble to heal, keep sow/jow up at all times. He hits hard at first, but after the second shatter he's more than manageable without using bubbles. Duo'd this guy. Me, Lv69 ret pally with sword and board and a prot pally with 1200 healing in healing gear. Was nobody else in the zone but us. Ran up to this think it'd be a simple fight, and quickly realised this wouldn't be easy. He hits for 1200 on 8k armor. This guy spawned little shardlings that made both our job really hard. So I judged wisdom so I could get enough mana to consecrate everytime it was up and keep em off the healer. I traded the healer pally 2 stacks of Super Mana pots and we sat there for about 10 minutes witling this guy down and trying not to go OOM. When he spawned his last shardling the healer was low on mana and his pots were on cooldown. I used lay on hands and died soon after. Healer bubbled and then used a pot when it was ready, beat down the last shardling, finished the rare, ressed me, and then we looted. bugged out for us directly opposite the forge camp. He patrolled round and into the bashir style camp, got stuck against the fence and despawned. repopped a few minutes later not far away but got stuck on a rock near the same spot, we killed him but his corpse went underground. I kited him to Thunderlord Stronghold as a 67 hunter and he was at about 60% by the time I got there. The notable thing is that the guards there do not attack him. So when I got him there I had to run around him in circles as I continued to kite. Killed him eventually, a priest and a rogue helped me out for part of the fight. An extremely easy kite as long as you follow the paths so you don't get adds that hit you while using AotC. Edit: Dropped plate pauldrons with stam int and mp5. Kinda crappy drop if you ask me. LoL just solod as a 70 Holy Pally, simple just jusdge wis then seal of vengence, had to pop a pot but eh it was worth the easy blue. Can be soloed as a prot warrior, nothing fancy, just a long fight. Keep up shield block, thunderclap and demoralizing shout, and it hit for less than 200. Log showed that I did over 118k damage to it and the shardlings. I killed him without kiting. Sick Voidwalker on him. Heal voidwalker... Heal him til you lose aggro then soulscatter. hunters, use track giants to show him on mini map. Kited him to Toshley's Station as an alliance mage. Those gnomes sure have firepower, they took him down in mere seconds. Pretty easy, I just ran, jump-spin ice lances kept him on me fine, Blinked once in a while to gain some distance. Soloed as a 67 pally, Lay on Hands + Bubble/Bandage + Super mana potion = Long tough fight. In the end I still came out with around 15% health and no mana. Dropped the plate version of power. 10K armor + holy pally = wished i had help because it took so long. just soloed as a level 67 PvP specced subtelty rogue, no special gear just stuff from the quests in outland. just hemmorage spammed with some eviscerates and kidney shots, no bandages and no pots just 2 evasions. fairly easy but was very close towards the end. I'm not really sure what everyones talking about. I was going to kite him to Evergrove when I flew over and saw him, like everybody suggested. Then I noticed my 1 moonfire max rank took him to 92%. So I turned around and fought figuring I could just run if things got hairy. I don't see any reason to kite this mob anywhere. I destroyed him as a 66 Ice Mage. Started out from long range and lobbed a couple frostbolts, then cycled through my cooldowns on all my instant spells (Fire Blast, Cone of Cold, Ice Lance, a string of Arcane Blast). I ignored all the hits he gave me and downed him in a minute, maybe less. His adds for some reason bugged out-only one aggroed on me, the others stood there even when I approached them. They stay spawned even after his death (Watched them for 1.5 minutes to see if they would despawn). Dropped Felstone Pauldrons of Healing, Req lvl 68, 829 armor and +101 Healing. Pally stuff, I guess. He walks in and around the area east of Thunderlord Stronghold. He stopped up at the top of the ramp leading to Forge Camp: Anger-I attacked him as he turned around. No adds near there, but a Lashtail is at the bottom of the ramp, so watch out if you try it. He was significantly nerfed in patch 2.4. He used to be elite, that's why people were kiting him. He's hardly a challenge now. I was helping a friend kill mobs near Singing Ridge and soloed him (70 druid balance specced) with summoning treants. My rogue friend was killing the shardlings and any raptors/serpents that aggroed on me, the fight lasted 32 seconds. He didn't hit me very hard. Note: One of Gruul's sons patrols near there, also watch out for the serpents,spiders, and raptor. I've only seen him spawn one in Singing Ridge. Also, I did not kite him, I tanked him in moonkin form w/o healing once. I'm not in that good of gear. Like Draol said, he was definantly nerfed. Solo'd with a 69 priest, all I did was refresh SW:P every 10 seconds as to not let him leash and ran down the Churning Gulch. I tossed in SW:D where I could. Morcrush has been severely nerfed. I just got done kiting him to death as a Dreamstate Druid in a mix of leveling gear and S2 gear. Using only Moonfire, Insect Swarm, and Travel Form, I didn't take a single hit, and had him dead in about 2 minutes. As a lvl 70 warrior, barely geared to offtank Kara.... I found him and killed him on the spot without going below half my health (11114). He isn't elite, don't be fooled by the silver dragon around him portrait. The trick I used was simple... I never looked down. If you have enough confidence, just burn out Morcrush, then take a potion and kill the shardlings. dont know if they lowered his hp's but he's even easier now, i started kiting him between skald and the bridge to netherstorm and even before i reached the bridge he was dead.. I had very little problem as prot paladin. I found him twice in 2 days and both times i just flew in, judged wisdom and just tanked him to death. He made some Thunderclaps, but it didnt seem to hurt me seriously. I checked my combatlog and saw "Thunderclap has hit you for ~60" everytime he did it. Got plate and leather agility shoulders. Soloed today as a 67 assassination rogue. Opening with Cheap Shot, then Mutilate for full Combo Points, followed with kidney shot. Easy mode from there with standard rotation of stuns and Envenom Crits (Coldblood FTW). No potions used, and got to 25% health by end of fight. Vanished to despawn little guy and looted. Got "of the Bandit" so I was pretty happy. Can someone give me coords but i can't find him :/ I was ridin' through the Blade's Edge Mountains but I didn't meet him. I will be grateful. But I did get the Medium Rare achievement, so it was worth the effort. soloed with a level 67 prot warrior lived with like 300 HP was a kakewalk. Like many said before - this fight was a piece of cake for my 67 Retribution Paladin. I soloed it as a level 66 rogue...took a couple tries, though. I made sure there were no other mobs within aggro range, then ambushed him and immediately popped Evasion. Make a macro when you come to Blade's edge. Check the map on wowhead where to look for them. and map it e.g. to your mousewheel. Found this guy roaming around Gruul's Lair. Easy kill (level 80 Fire Mage) and dropped Felstone Spaulders of the Bandit. Also rewarded me the Medium Rare achievement. Shoulders look nice. I'm sending them to my druid. I was farming for some Raptor & Serpent meat when this chap appeared just moments ago. He spawned at 73,27. Solo'd him on a level 67 Holy/Shadow hybrid Priest in nice gear. He hits hard, but if you keep renew on yourself and use a lightwell, as well as some emergency buttons like desperate prayer, you should have little problems with him. Shadowfiend comes in handy if you get low on mana during the fight. Soloed on my 63 spriest. Was flying around looking for mining nodes and i saw him roaming around. Being 5 levels higher than me i was skeptical at first but thought why not right? First couple times i died cause i just ran oom and had adds aggro me as i was tryin to kite. 3rd time found a clearing and just did circles took two dispersions and a ton of fear bombs but it was doable:D.
This guy reminded me to buy more grape Crush. I still killed him though. Appeared within 10 hours after realm maintenance. I logged in at 18:50 CDT to sweep Outland for rares. Maintenance usually ends at 13:00 CDT. I found him, dead, at 19:43 CDT. Was flying around Blade's Edge, looking for this guy for Medium Rare, and saw his shardling on the map. Looked it up, and thought he was dead, but looked in the Grull's Lair area, and he ended up being there! Took a sceenshot just to post this up. So, my conclusion from this is, either shardlings pop up in some of his other areas when he spawns, or he can respawn quickly somewhere else after dying. Found him patting around (67.1, 64.9) at 5:26 am server time on Elune. Spotted him on Razor Ridge 67,64 on Blades Edge Mountain. Killed him with my Lvl 70 rogue. Dropped Felstone Spaulders of Intellect. Just killed him at soulgrinders spot in the Blades edge mountains loc:@61:22 time of 2am pacific time they seem to come out after midnight lol they must be ghouls ...hahaha. by the way i was using npc scann by curse.com or you can use macro /target -npc's name . Found him at Soulgrinder's Barrow which is marked about where the "G" of "Gruul's Lair" is located on the large map. He had one shardling buddy. My 64 Holy Priest had no trouble with him but the shardlings are a pain and killed me as soon as I was OOM, which was about 5 seconds after he died. Ignore them and kill him. If necessary, you can rez at his corpse; they despawn shortly after his death and I had no trouble looting or getting the XP. I'm camping for the Bloody Rare achievement; this guy plus one of the Hellfire mobs are all I need. Went afk for an hour or so to have a bath, logged back in and checked all his spawn points; at one I found three Morcrush Shardlings just standing idle, yet no sign of the big guy himself. Did several rounds of every spawn point again but found nothing, not even a corpse. I'm not sure if I missed a kill while afk and the shardlings just bugged out (they were killable), yet this seems unlikely due to how deserted Blade's Edge Mountains are. My only other theory is that he despawned, which is pretty gutting. I found this guy at 68.46 and killed him easily, along with his 3 minions. He dropped Felstone Mantle first try. I found him at soulgrinders barrow just next to the altar my silver dragon went off for the first time and i was amazed he had one little crystal buddy and barely hurt my lvl 66 Night Elf DK. I don't know if this matters but this was on the fire tree server. 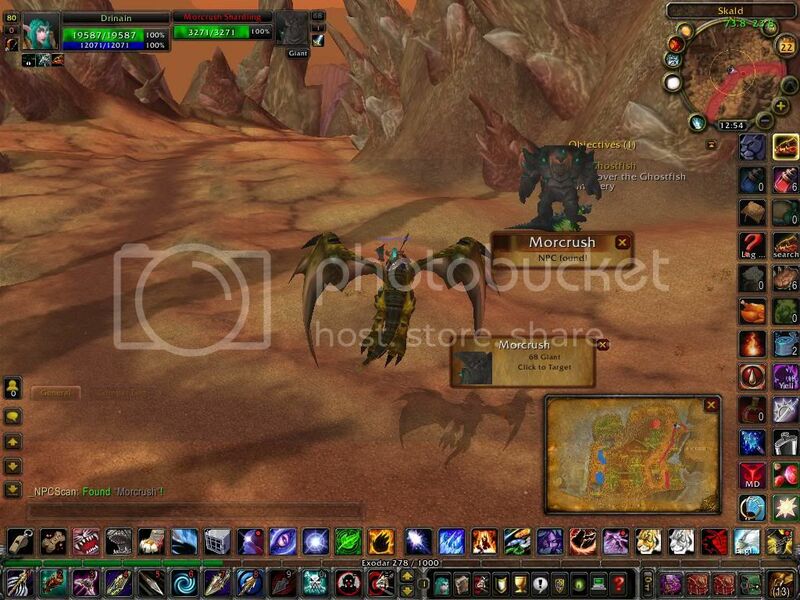 Found Morcrush with NPCScan while flying above Bladed Gulch. 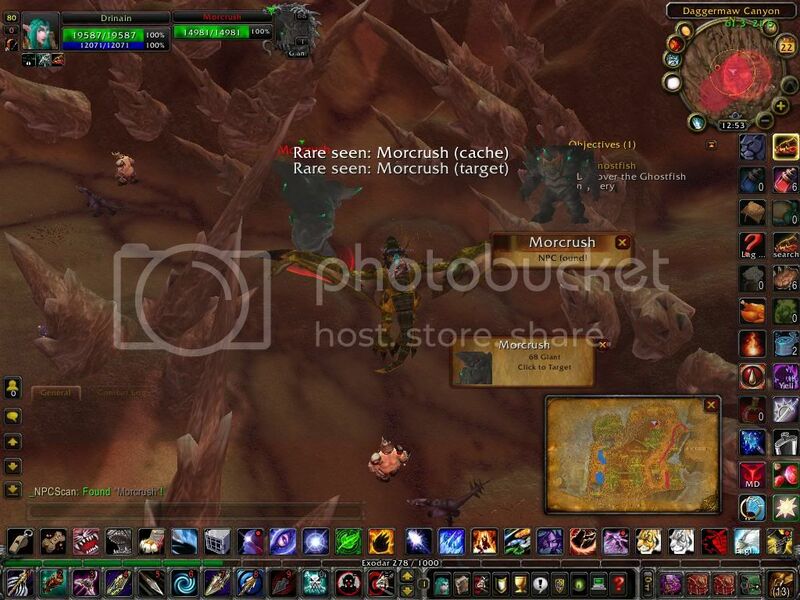 Once killed, Morcrush dropped Crystal Fragments and Felstone Pauldrons of Arcane Protection. He also gave 30s, 75c. I checked all his spawn points every day for about 2 months without a trace, and then I finally found him at 68,74 - the extreme southernmost point in his range. I had already gone the whole length from south to north and almost didn't bother to double back for a second check this time, but I'm glad I did. I probably happened along the moment after he spawned. Extremely lucky to have been there at the right time, as he either almost never spawns or never lives more than a minute or two on my server. Unfortunately he dropped the plate shoulders, and I wanted the mail. So it goes. Found him today, 29/08/2017 at 69.4 - 69.1 at arount 21:15 on Draenor server. He dropped Fragmentos de Cristal x 1, Palas de Pedravil of the Soldier, and 13silver 10copper. Esse PNJ pode ser encontrado em Montanhas da Lâmina Afiada (9).